I love fruit crisps! In my pre-paleo days I made them throughout the year, using blueberries, mulberries, pears, peaches, and apples – depending on what was in season. My favorite topping was made from white flour, white and brown sugar, butter, and oats… All of which I have since learned were not doing my digestive system any favors. After I went grain free, I experimented with recipes that used nuts and nut flours. This recipe from Heal Balance Live for a master fruit crisp topping uses almond flour and is quite delicious and even pleased my picky husband. But since I gave up nuts a few months ago in an effort to improve my digestion and keep my autoimmune disease from flaring up, fruit crisps had not been part of my baking repertoire and I missed them deeply! Then this week I discovered that some of the apples we picked back in September and were slowly eating out of the crisper drawer of the refrigerator had gotten a little mealy in their advancing age but knew they would be perfect in a pie or a crisp, especially combined with the tart seasonal flavor of cranberry. So, I started improvising with shredded coconut (this is the brand I used), coconut flour, and tapioca starch (this is the brand I used) to see if I could come up with a fruit crisp topping that could transform them into a warm and tasty dessert. 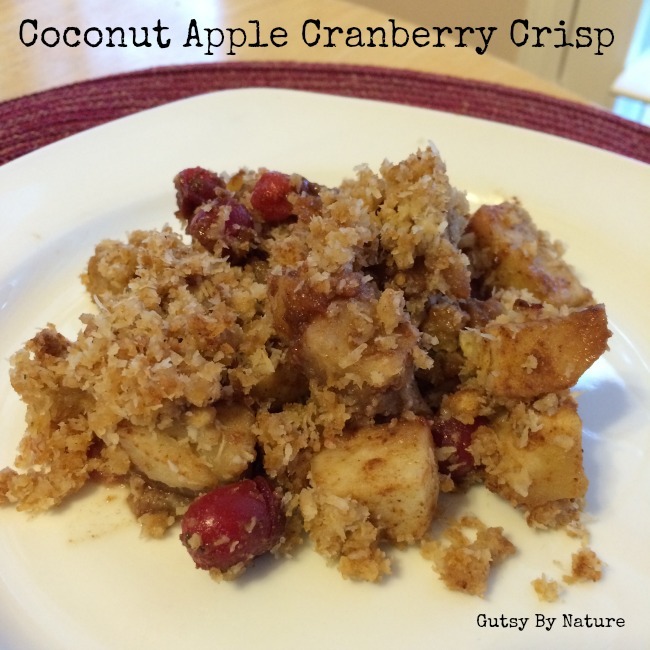 I am happy to report that this recipe for coconut apple cranberry crisp is gluten free, grain free, dairy free, AND nut free… and just as delicious as the junk filled crisp I used to make! The flavors are also excellent the next day, but I have found that the gran free topping looses its “crispiness” much more rapidly than the wheat based original. I recommend letting it cool just 10 or 15 minutes and then eating immediately. It would be delicious with non-dairy ice cream! NOTE on shortening: If you tolerate dairy, then you may want to use grass fed butter. Otherwise, use palm shortening but make sure you are buying a brand that is sustainably harvested. This is one I trust. Paleo autoimmune protocol (AIP) – This recipe is almost completely AIP friendly as written, and will be acceptable for most people. It does include a small amount of nutmeg, which Sarah Ballantyne lists as a seed-based spice that one should avoid, at least initially. As a side note, both cinnamon and cloves are not seeds and are safe! Specific Carbohydrate Diet (SCD) or GAPS – Unfortunately, the tapioca starch and coconut palm sugar are both forbidden on SCD and GAPS. If you want to experiment with substituting coconut flour for the starch and using honey for sweetener, please let me know in the comments how it turns out. If you can tolerate nuts, then the recipe I linked above is a great option to substitute for the topping. Low-FODMAPs – Apples are a high FODMAP food and there is no way around that. However, you could use the same topping on blueberries and make a delicious dessert that is low-FODMAP. Flavors of fall with a crispy grain, nut, and dairy free topping! In a small saucepan over low heat, combine honey, coconut oil, and spices to melt and combine. Pour honey, oil, and spice mixture over apples and cranberries and toss to combine. Spread fruit in shallow pie plate, 8x8 inch, or 2 quart baking dish. In a small bowl, mix all topping ingredients. Use your hands if necessary to create a crumbly mixture. Bake for 35-45 minutes, or until fruit is soft and juices are bubbling and topping is browned and crisp. Allow to cool for 10-15 minutes and serve warm. Shared with Real Food Forager’s Fat Tuesday, Easy Green Mama’s Gluten Free Tuesday, Holistic Squid’s Party Wave Wednesday, Phoenix Helix’s Paleo AIP Recipe Roundtable. We’re eating this right now for our Christmas Day dessert and it is magnificent! I made it in the crock pot (2 hours on high) with 5 apples–2 Pink Cripps, 2 Fuji, 1 Gala; I tripled the cranberries (1.5 cups); Doubled the ingredients from honey to nutmeg (in the “fruit” section) and used the topping as written. This is fabulous!! So happy to find a nut-free paleo crisp. We are eating this now…no need to wait for Christmas!! I poured a little almond milk on mine. Yum!!! So so good!!! I tried to rate it 5 stars but it wasn’t working for some reason. I am on a ketogenic diet and would like to use guar gum as the thickener in recipes. Do you have any experience using it. What amounts would you suggest. So far I have just used it in cold items using a guess-and-by-gosh as to amount. Haven’t found any results looking online. I use stevia rather than honey or other sugars but seem to do OK with it. Your recipes are great. I have used many of them using substitutions to make them keto friendly. I worked with a woman whose kids had tonnes of food allergies, but one loved apples. I’d try GF/DF /NF recipes and bring them in for her. She loved this, they loved this, I loved it, my sister loved it. I like my crisps and crumbles in a deep dish. I used one of those aluminium 9′ X 6.5″ by 2.8″ pans (if I never see the pan again, it was a small investment). However, that’s about 7 or 8 apples (I also like to use at least 3 varieties for different textures). I finally figured out, if you use double the apples, you need double the sauce and more crumb. Extra delicious once I got that nice bubbly sauce happening!